Most of my weekend wear is what I would call basic. It would consist of a pair of jeans, a pair of comfy-practical shoes, a tee shirt, possibly a jacket or vest, and a few added accessories (maybe). Something a lot like this . 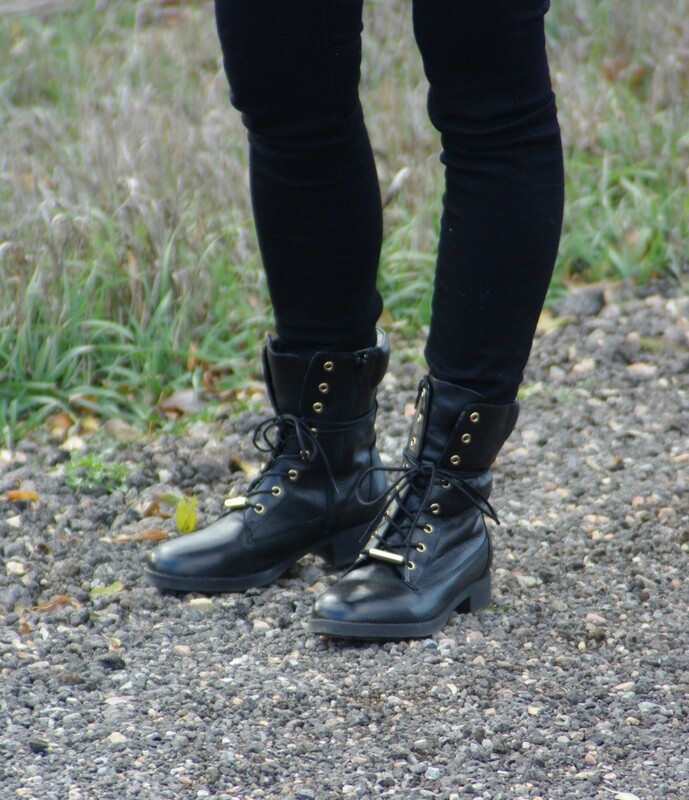 . .
A pair of black jeans and combat boots . . .
A stripe long sleeve tee and down vest . . .
Then add a funky necklace, huge bonus when its handmade with love by a friend. This is one of Suzanne Carillo’s collection which she gave me as a gift last month, I have a hard time taking it off since it matches just about everything I own. 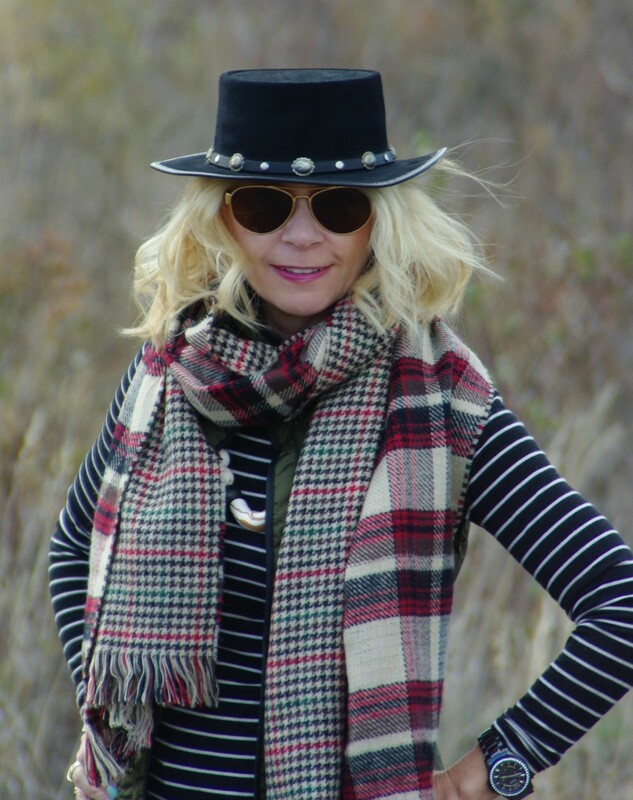 Since it’s now fall-going on winter I layered a nice warm scarf (loving this reversible one I found at Francesca’s) to my basics . . .
And then topped it off with a western style hat. *just a little note on hats. I’m one who enjoys wearing hats and for many reasons, they’re great for bad hair days, they’re great for windy, rainy, and snow days, they keep the sun off my face, and they are one great statement piece. This one I purchased 21 years ago and I still find myself grabbing it time and time again. There you have it, my basic weekend wear or otherwise known as, take me anywhere I need to go wear. Hope you all had a wonderful weekend and are now ready for the start of another great week. Thank you Patti, I’ve been on the search for just the right combat boots for my style. Took some searching. Seriously though I’m pinning this look. All the details are wonderful. I especially like the vest and the boots. You’ve made a casual vest look dressy. I would be borrowing that hat if I lived closer. I’d borrow the boots too but my big feet wouldn’t fit in them. They make me want my old Doc Martins back. Oh, you can’t believe how many times I’ve kicked myself for giving away my old Doc’s. Did we ever think they would be back in force and so soon? Well, maybe the twenty years just seems soon, right? Looks fabulous on you. If you wear a potato sac, it will look fabulous on you. Don’t you get cold arms? I find that just a long sleeved T-shirt makes me feel old all the time. Love the boots. PS And the hat. Wish I could wear a hat. Can we have a close-up of the necklace next time? Yes, I will get a close up next go round, for sure! You can wear hats, I’ve seen you a few times. And did you mean cold instead of old? Actually it wasn’t that chilly outside so the vest and scarf were a perfect choice. As for the potato sac, haha, I don”t know about that. Seriously, this hat does take us back to some good days, right? You look adorable. I love and the layering! Love to see a close up of your necklace. And that hat!! Fab! I see why you keep reaching for it. It looks great in you. Thank you, my cute friend. 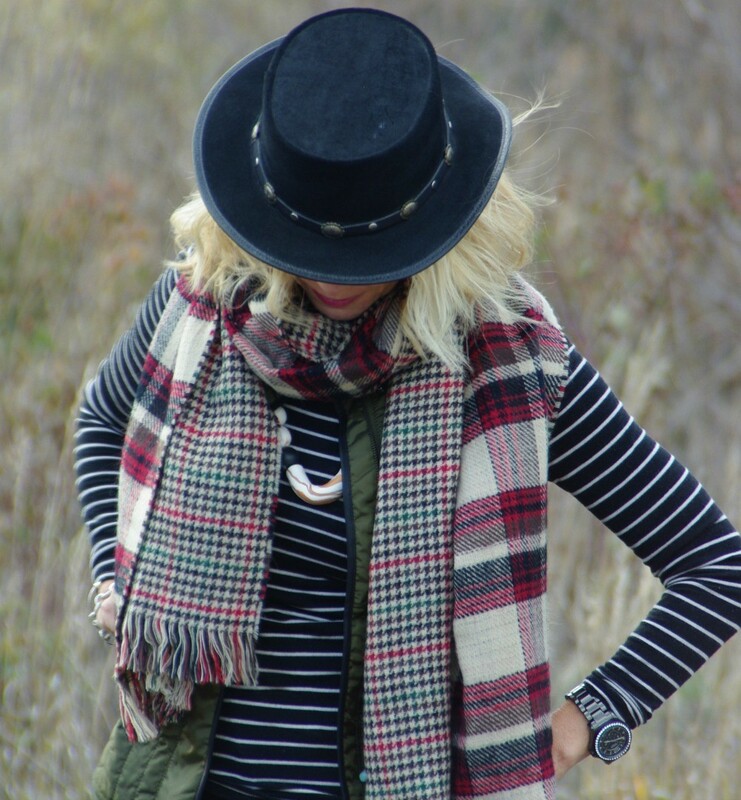 Layering days have finally arrived! Oh Trina, I love this! 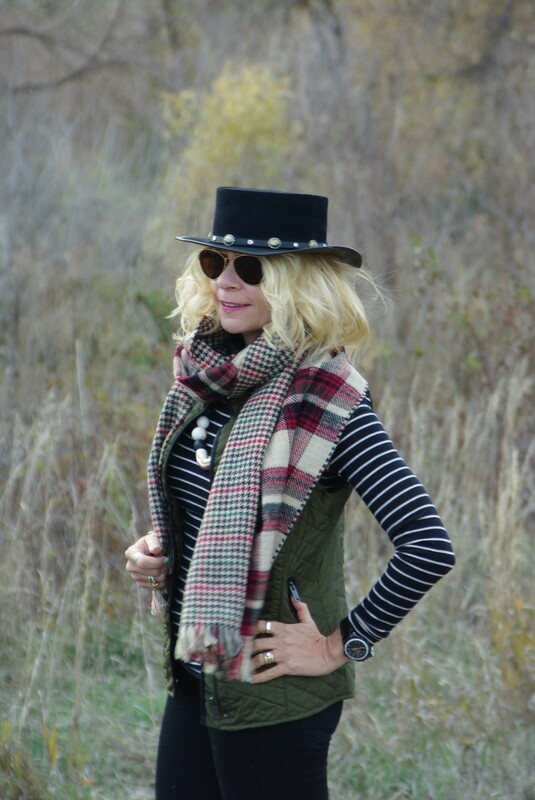 Love the olive vest, and striped tee and scarf. You took some very trendy items and made it unique , and I bet you owned them already! Very chic with such a laid back vibe! Thank you Elle. And you were correct, except for the vest, which is quite new, everything else came from my closet. Great look! I’ll have to check out Suzanne’s necklaces! Me too, with the scarves. Everytime I’m in a store I think I need one in that certain color, but I’m running out fo storage space. Love all the great layers and mix of patterns! i can’t believe that hat is over 20 years old, it looks brand new. This hat reminds me that sometimes it pays to splurge on something that speaks your name.